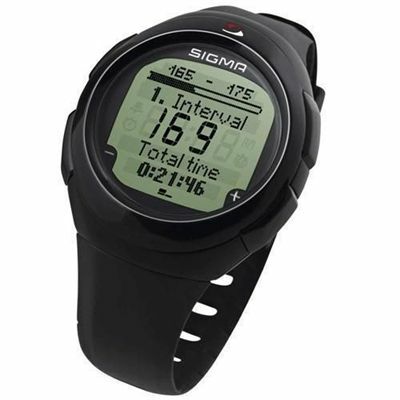 The Sigma Onyx Pro is digitally coded with preset and individually acceptable endurance and interval training ranges. The training zones may either be calculated in line with IAT (individual anaerobic threshold) or maximum pulse rate. The detailed analysis of the Sigma Onyx Pro is perfect for all professional and ambitious sportspeople and features new innovations including a magnification function for better readability and a new kind of navigation for intuitive menu guidance. This monitor also features 7 memory locations, a lap counter (50 laps with average and maximum pulse rate indications), a light and a battery change compartment. The Sigma Onyx Pro has a digital coded chest belt that enables interference-free training. Due to the digital coded transmission this monitor will not display your heart rate on gym equipment that has a heart rate receiver built into it - this simply means that your heart rate will be displayed on your wrist instead and so you have to wear both the transmitter belt and the receiver in order to monitor your pulse. This model has a Sleep Mode (when only time and date are displayed), which it switches to automatically if no exercise is undertaken after 5 minutes, using only very little power. It may therefore be worn as an everyday watch. for submitting product review about Sigma Onyx Pro Heart Rate Monitor.